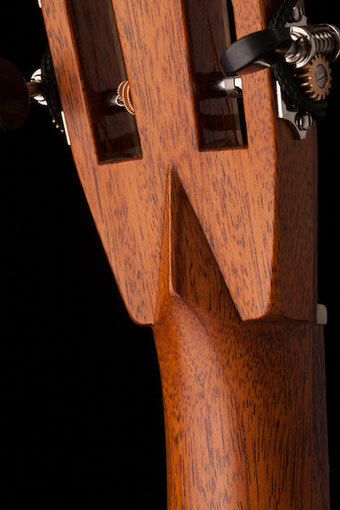 The bird's beak next joint is the traditional spanish method for joining the headstock and the neck. It's advantages are increased strength in one of the most vulnerable spots on the guitar, and aesthetic beauty. The point on the back, the Volute, has a corresponding extension on the front of the neck. They form a bird's beak shape, into which the headstock piece is mated. the result is two fingers of continuous grain extending beyond the nut area, as well as a greater cross-sectional area. Of course this joint must be painstakingly cut by hand.